My previous post (ICT – Getting Accountant Buy-in) made me think more than I had originally anticipated, and I have concluded that, in a way, I put the cart before the horse. My error was to jump straight in and try to help get the message across as to how to convince management (and accountants) that your project is a great idea, I did not, or have not, discussed what are the best tools for the job – hence this post. I saw an interesting post this morning by Robert Scoble discussing how there has been a shift away from traditional personal blogs to a more business centred view of blogs. My personal opinion is that this is good thing and it shows that the commercial world is following developments made by the web for social benefit. Scoble would prefer that the blog remained personal. 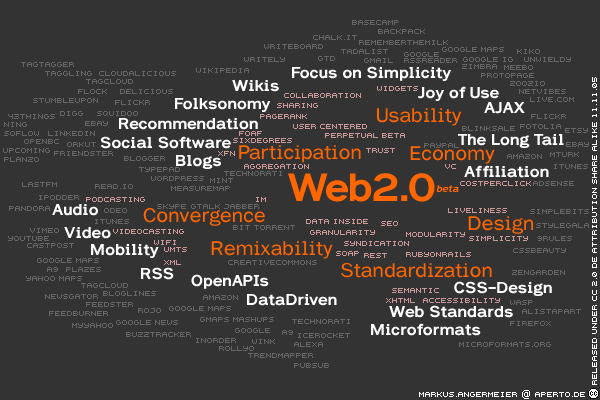 Web 2.0 – the biggest buzz word to hit the internet since .com. The technology that has been developed and the interaction that has grown has been amazing, now everyone twitters, facebooks, blogs, IMs, emails, VOIPs, RSSs the list goes on but the question remains how do we apply this to everyday business, or, when does playtime stop and work begin. Without the embrace of the commercial sector social media will remain on the sidelines, only being accessed by a select few while topics of conversation will remain unfocused and irrelevant to many employees. By embracing social media the commercial sector will help to develop the potential and attract new investment, just look at email and websites. What we have to do is think how a commercial organisation can benefit from using social media as part of its daily toolbox. Work life balance is now more important to many employees than ever before. At the same time being an employer of choice is high in the priorities of many organisations. Somewhere a compromise needs to be achieved. Social media tools can help deliver that compromise. So the technology is available – but what about the problems..? It is often said that the biggest thing missing when working at home is the banter – my question is why..? Tools such as twitter and instant messaging can help. Secure and shared between employees, IM can deliver the banter during the normal working day. I have also heard people say that it is easier to pop down the corridor and see someone. What happens if the person you are going to visit working from home..? Also, if seeing someone is so important, what about video messaging..? Other examples of where social media can benefit an organisation, but is not being fully utilised, is with regards to collaborative working. Why do we need to send around emails cc’ing the world and his dog – a blog would help deliver this. Imagine a development project where you need to be kept informed, but not required to respond – it is easier to RSS a blog than have to skim through a cc’ed email to find what you are looking for. Another collaborative tool is the Wiki – the ability for a group of people to join in with the creation of a document without having to email around a paper constantly out of date. Think of Facebook, imagine that a group of colleagues working together had the ability to keep each other informed (with or without pokes!) with live updates, information and reports from meetings, visits etc.. It is another example of how with simple thinking a play toy can be changed to be a useful business asset. There are many tools available but it is essential that they are not dismissed out of hand as toys. They need to be considered and investigated as possible tools to help productivity in the work place.